Today's culture sends many messages about men. Not very many of them are positive. Not surprising, it's left some of us woman wondering: Husbands-what are they good for? I was pondering today, what good my husband has been to me. Without him, what would have been different about me? It scares me to think about it. I mean, my guy has been at the heart of most of my personal improvements and my spiritual growth in this journey toward heaven. I know some of you suspect I’m taking a backhanded shot of some sort, with implications that guys make women suffer, so of course we make progress in patience, and long-suffering; that in short, guys make us saints. They are our penance, and we become holy. Without my husband, I would be less. – Less appreciative of art and beauty around me. – Less aware of miracles. – Less in my understanding of God the Father. – Less understanding of half of humanity. – Less intimate with my Lord. 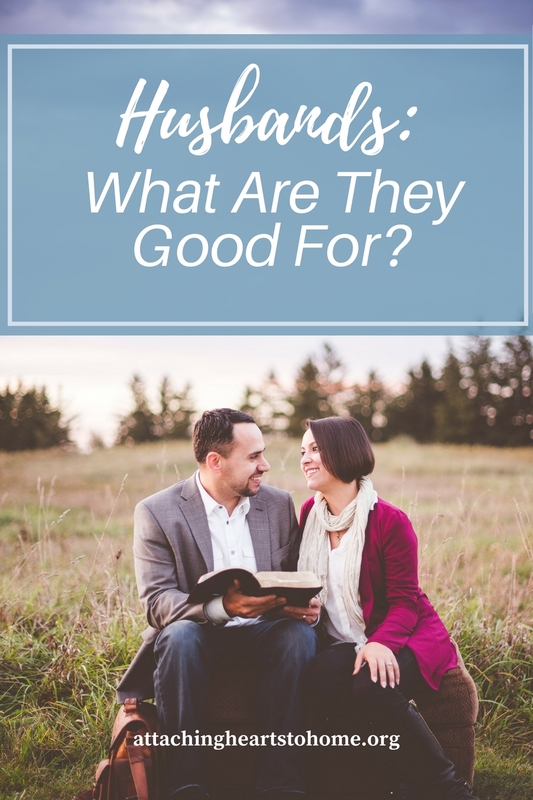 How would you be “less” without your husband? Be intentionally positive. Write it down and share it with your man, tonight. I do weekly talks on family and attachment. Come and join us as we discover practical solutions for your family.